One of the interesting things about TTAB proceedings is that there is no live testimony before the people who will decide the case, the judges. That’s generally a good thing; it means the proceeding is less expensive and time-consuming. Trial testimony is done like a deposition, with just the parties and a court reporter, and the transcripts are what the Board reviews. In more recent years, the Board has encouraged the use of declarations, rather than testimony, to further ease the burden of a TTAB proceeding (and I suspect their reading burden). It also means, though, that the judges sometimes get cases that have a fairly mystifying record. Because they aren’t present for testimony, the Board never has the opportunity to clear up any confusion, help ensure that the record is complete, or evaluate the witnesses’ truthfulness and demeanor. I expect everyone would agree that there is a confusion problem. I suspect everyone would also agree it’s unlikely that the similarity is a coincidence and so there must be some kind of story here. I assumed, and still believe, that it is the common situation where someone got the bright idea that they can get some kind of rights in another’s trademark by registering it first. I still think that, but the Board didn’t go that far. It couldn’t, because the parties told two irreconcilable stories, “diametrically opposed” in the Board’s view, about the mark. 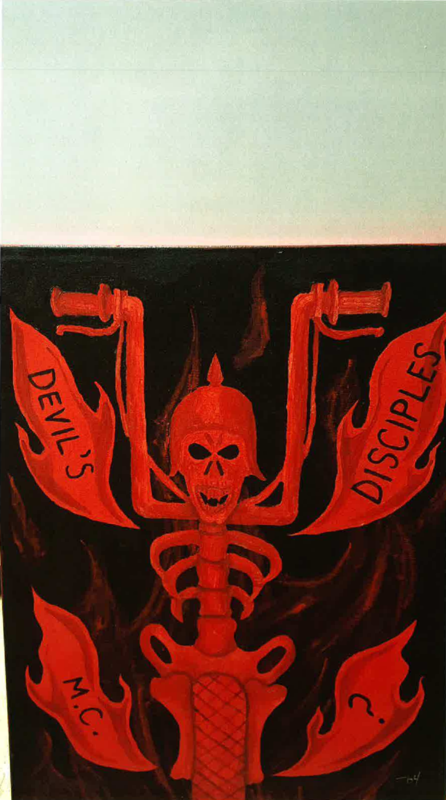 and the club created its patch based on the painting. The club has been using the mark continuously since then. Co-founder Johnson testified by declaration that applicant Woodard had been a member of the club from about 1974 to 1979, but was kicked out when he was imprisoned. Sixteen years later, when Woodard was out of jail, he rejoined, but was kicked out again about a year later after he tried to rob Johnson. Woodard agreed that he was imprisoned, but that’s about the only fact that the parties agreed on. 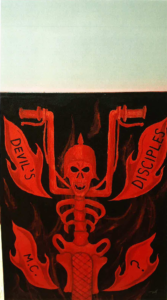 Woodard claimed that he had been a member of the motorcycle club since 1971, had been President from 2005 to 2010, that he was considered a charter member and partriach of the club and regularly attended meetings (except when he was incarcerated), and the motorcycle club gave him the authority to award, distribute and revoke the club patch.1 In 2008, a member named Chase was kicked out but didn’t return his patch. 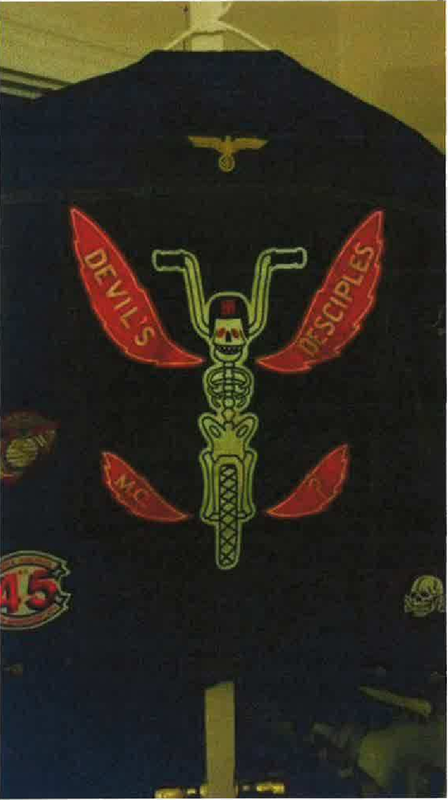 Chase then proceeded to establish a new club, also called Devil’s Desciples Motorcycle Club, using the same patch. Woodard clamed that Johnson left the original club in 1980 to move to Alaska, severed ties, but returned to the original club in 2001. According to Woodard, Johnson then joined the new unauthorized club. Woodard then began an enforcement program against the use by the unauthorized club, which is why he filed the trademark application. Often when you hear two versions of a story you can guess where the truth lies. Nothing like that here. Based on the record before us, we find that Opposer has failed to meet its burden of proving by a preponderance of the record that Applicant did not own and “exercise legitimate control” over his applied-for collective membership mark as of the filing date of his application. We acknowledge that the record shows that the co-founder of Opposer’s motorcycle club personally conceived of the inspiration for the design of Applicant’s mark. However, in the face of conflicting statements made by each side regarding use and control of the mark over its members and the dueling sets of bylaws, it is difficult to assess the parties’ objective intentions or expectations. The statements made by Applicant in his testimony declaration that he, not Opposer, was authorized to control the applied-for collective membership mark, could certainly be challenged as self-serving. Opposer, however, elected not to cross-examine Applicant, making it difficult for the Board to assess the credibility of Applicant’s statements. In addition, had Opposer cross-examined Applicant and Mr. Ayre, it could have asked probing questions concerning the existence of more objective indicia of ownership such as costs incurred in printing membership patches, invoices documenting such costs, or revenue (if any) realized from the sale of patches to members. Equally problematic, there is nothing in the record to suggest that the bylaws submitted by either party are publically available, making it difficult for the Board to ascertain which party the public associates the mark with and which party exercises control of the mark. The only evidence of public efforts to police the collective membership mark consist of the cease and desist letters sent by Applicant to an unrelated third-party and Opposer’s witness Mr. Johnson in his capacity as an individual (along with another individual named Mr. Tringale whose testimony we do not have before us), evidence weighing in Applicant’s favor. But all was not lost; the club had shown that it was the senior user of an unregistered trademark that was confusingly similar to the applicant’s mark, so the opposition was sustained under Section 2(d) of the Lanham Act. The case has a good description of the law on ownership of collective marks, if you’re interested in that sort of thing. TL;DR, it’s the same as regular marks. Devil’s Desciples MC v. Woodard, Opp. No. 91228868 (TTAB May 15, 2018). Wow, really interesting twist on TM ownership. 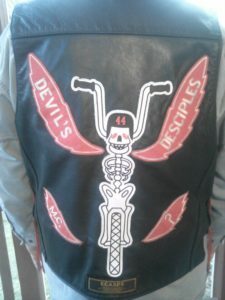 Desciples’ testimony & bylaws were persuasive & shed some light on one outlaw (1%) motorcycle club’s organisational culture.